According to text book knowledge, the usual oxidation states of gold in compounds are +I and +III. The divalent form (+II), on the other hand, prefers to form polynuclear compounds or simply undergoes transformation into the mono- and trivalent forms. However, the elements next to gold in the periodic table are quite different in this respect. The ions of the coinage metals, copper(+II) and silver(+II), are usually present in divalent form and this is also the case for gold's neighbors to its left and right, platinum(+II) and mercury(+II). It has been postulated that when gold undergoes photochemical catalysis reactions, the +II state may form, but definitive evidence has not been provided to date. The corresponding proof has just been advanced by researchers at Johannes Gutenberg University Mainz (JGU) in a recent publication. 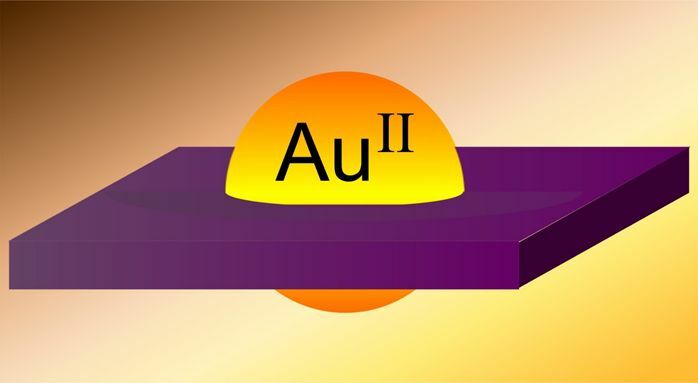 A team of chemists led by Professor Katja Heinze at the Institute of Inorganic Chemistry and Analytical Chemistry of JGU has been able to isolate and analyze gold in the very rare oxidation state +II. This provides the missing links in the homologous series of the coinage metal ions copper(+II), silver(+II), gold(+II), and in the 'relativistic' triad of platinum(+II), gold(+II), and mercury(+II). "Fundamental data unknown to date such as ion size, preferred structural arrangement, and the reactivity of gold(+II) have now been made available," explained Sebastian Preiß, doctoral candidate in Heinze's team, who was able to isolate the gold(+II) complex in its pure form for the first time. The findings have been published in Nature Chemistry. The stabilization of the very labile gold(+II) ion was achieved by the researchers with the help of a so-called porphyrin used to encapsulate the gold(+II) ion. In combination with magnesium or iron ions in the center, respectively, the porphyrin macrocycle is present in the green pigment of plants (chlorophyll), and in the red pigment of the blood (heme). With gold(+II) at its center, porphyrin blocks the normal reaction pathways of gold(+II), i.e., the formation of polynuclear compounds or the conversion to the more stable gold(+I) and gold(+III) complexes. "This enabled for the first time to investigate this unique class of stable mononuclear gold(+II) complexes and to describe them comprehensively," summarized Professor Katja Heinze. Interestingly, the arrangement of the four atoms next to the gold(+II) ion is not square planar with the atoms placed at equal distances to the gold as in the case of the corresponding structures of gold's neighboring elements copper(+II), silver(+II), platinum(+II), and mercury(+II). Instead, the structure shows a rhombic distortion with two short and two long distances. In technical terms, this previously unobserved phenomenon in the case of gold(+II) ions can be attributed to a second-order Jahn-Teller effect caused by the relativistic properties of gold. Since this new gold(+II) compound can also be prepared from the gold(+III) complex present in potent anti-cancer agents, the researchers tried to find out whether the gold(+II) porphyrin also plays a role in biological systems. They discovered that the gold(+II) complex can be generated under near physiological conditions from a cytostatic gold(+III) agent. On exposure to atmospheric oxygen, the gold(+II) porphyrin forms reactive oxygen species (ROS), which are known to induce apoptosis, or programmed cell death. "We thus have a plausible functional chain starting with a cytostatic agent and leading to targeted cell death with the gold(+II) porphyrin acting as an important link in the chain," emphasized Professor Katja Heinze. "A major impetus for us to continue with research in this field is that curiosity-driven fundamental research about unusual species enabled us to reach insights that could well be relevant to medical applications," concluded Heinze. Gold in its divalent form is stable in the center of porphyrins.